Team Crypt Creepers reviewed this attraction on September 30, 2016. 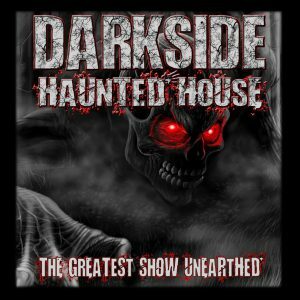 Down a dark, slightly winding path in the far off land of Long Island, there is a place known as Darkside, where the inhabitants are just dying to meet you. Too corny? Well, it doesn’t hurt to have a little humor mixed with your horror and that’s what you get (initially) as you wait in line to enter Darkside. But, don’t let the light-hearted humor fool you; inside, the killers and crazies are ready to scare you silly. 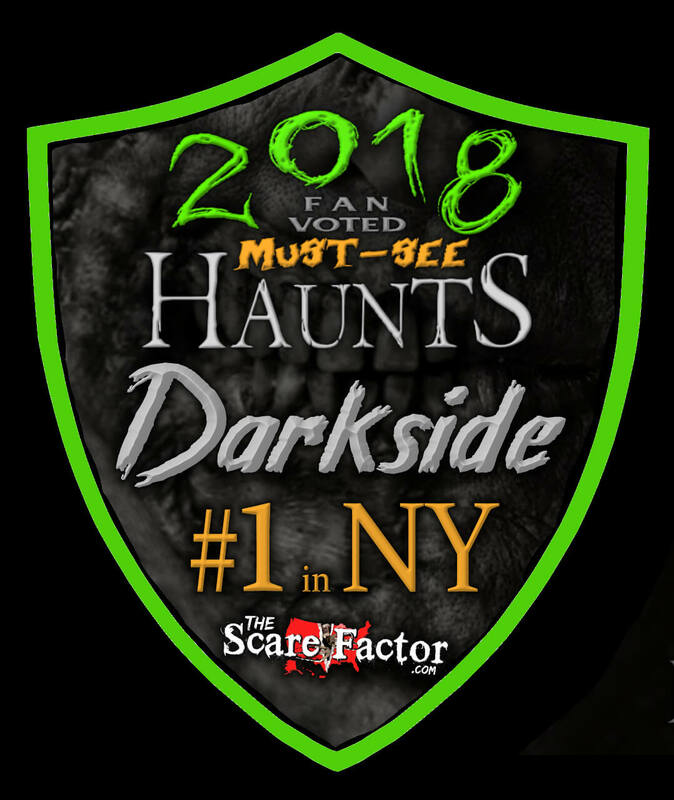 With a mix of animatronics, actors, and varied lighting and set designs, this haunt is one where you are sure to look over your shoulder out of fear of what may be lurking just behind you. A lot of the actors here go all out on their scares, which is almost as infectious as whatever is turning these people into murderous, crazed disciples of darkness. Even before you get inside the haunt to purchase your ticket, the laughs and screams start… and, if you are generous enough to provide your name to the kindly rule-giver, you may just find that the rest of his friends now know who you are and want to play with you even more. If they find the opportunity, they are happy to exploit your fears and relentlessly attack you for it. Practically every room here has at least one actor and they work with their surroundings by making use of the space, the lighting, the props and, of course, their victims. The dialogue is a mix of scripted and improvised and, when they make it up on the spot, they ham it up to 11… which makes for some good laughs from whoever in your group isn’t the target at the moment. There is a lot of variation used in this haunt; from backwoods hillbillies to bellhops, the outfits and makeup match whatever area you find them in. The makeup is realistic where it needs to be and masks are rare, but they work well when you do come across them. Every night, Darkside employs between 3-4 makeup artists to get the cast of creatures set up for frights. Hidden in the darkness of Long Island, this haunt may not have much in the form of signage to help guide you to its threshold, but there is no mistaking you are there once you roll up and see its frightening facade, including the resident gargoyle sitting atop the front foyer with billowing smoke coming from it. You stroll on past a hearse and up to a maybe-too-friendly caretaker who is more than happy to get to know you. But he isn’t the only one who is happy to help you. The staff here is happy to go out of their way to assist you, whether it be answering guests’ questions, or making a quick run through the haunt to find a lost phone. There are no real dangers in this haunt, and it is wheelchair accessible (but some wheelchairs may be too big for certain hallways and such, so it is best to call in advance and see what can be arranged). If you find yourself hungry afterwards, or in need of a shirt to show you survived the ordeal, there are snacks and t-shirts for sale, as well as the occasional food truck which will make an appearance. Also, free parking is allowed on their next-door lot. Upon arrival, you are greeted by the eerie sounds of creepy music and chilling noises; all the while, the haunting exterior of the house looms over you. It is obvious you are not here for a light-hearted, romantic comedy (though, you never know… maybe that cute gatekeeper who is letting you into her parlor will steal your heart away. Forcibly, of course). The sounds of chainsaws and banging can be heard from beyond the fences and screams sometimes escape from the mouths of those trapped inside who still have enough life to do so. Being surrounded by dark woods with almost no streetlights certainly helps. The lighting and sound used in this haunt definitely up the chill factor as you walk through. Flickering lights that slowly lead to pitch darkness and the sound of mice scurrying at your feet leave your mind to wonder, “Is that just an itch you feel on your leg, or did they just release rodents into that tiny room you are in?” There are some nice animatronic scares and some good detail put into the small rooms and outdoor areas. With even more special effects that are still being worked on, it can only get better. There were two props that I personally liked (that I haven’t seen yet anywhere else) which gave me a small sense of personal satisfaction. The house is broken into two halves: “The Village” and “The House,” but the haunt itself doesn’t have much of an actual theme. The Village is the outdoor part of the haunt and focuses on two or three general themes that actually tie together decently well. The House incorporates multiple themed rooms, even including a movie-inspired room or two for the film buffs. A lot of the scares were diverse and aimed at multiple members of the group. But, when you have one member who is obviously terrified, it is hard to resist the temptation to continuously scare them; I can’t blame the ghouls for taking a liking to a more…vocal prey. There were good uses of distractions and misdirection to keep our attention while a pop-out got into position, or while someone just walked on up to our resident screamer and got nice and close for when they turned to face front again. To get into the haunt will cost you $25, but there are various discounts and ways to save. 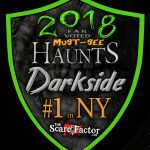 This haunt, along with Chamber of Horrors, Schmitts Haunted Mansion of Melville, and Gateways Haunted Playhouse, have worked out a special deal online where, for $80, you get a ticket to each haunt that can be used any day the haunt is open. But, I digress… back to specifically just Darkside. The walkthrough was about 30 minutes long, so at $25, you get more than one scare/minute. They have a decent amount of land, both indoors and outdoors, and make good use of it.